Los buques, durante su vida, están sometidos a condiciones extremas: operan en agua salada corrosiva y son zarandeados constantemente por las olas. Bajo estas demandas, los buques tienen siempre una vida limitada, cuya duración depende de varios factores, como el tráfico al que se dedican, la carga que transportan y la calidad del mantenimiento del que son objeto. Al llegar al término de su vida útil, los buques se venden para desguace, usualmente por medio de brokers marítimos de compra-venta, que actúan como intermediarios entre armadores y empresarios de desguace. El valor de un buque para desguace depende sobre todo del nivel de precio de la chatarra y del acero, que sufren importantes oscilaciones en el mercado. When ships reach the end of their working life, they make just one final journey: to the Ship Breakers. The mass of steel used to make ships still has a great deal of financial value, even after years at sea, allowing the Ship Owner or Operator to recoup some of the huge capital outlay needed for Financing a ship. Sometimes ships are taken into Dry Docks to be dismantled and recycled, and on other occasions these beasts are run on to the beaches at low tide to be broken down. Ships are subjected to some of the most extreme conditions over their working lives. They sit in corrosive salt water, are pounded by waves and wind, and aim to be constantly on the move. 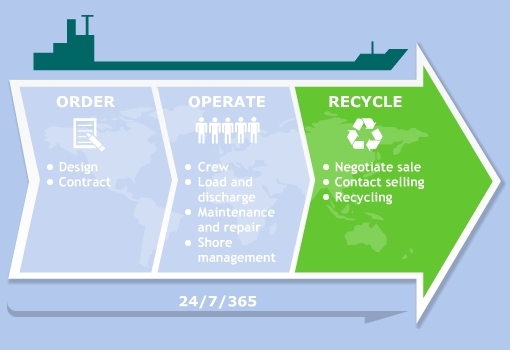 Under such demands, ships have a definite shelf life the length of which is dependent on a number of variables, such as the trade the ship operates, the cargo the ship carries and the care taken of the ship over its life. Ship Breakers, also known as ship recyclers or demolition yards, is a place where ships go at the end of its life to be broken apart. They receive a ship and dismantle it section by section, to sell the steel for recycling or for disposal. The deconstruction of a ship could take place at a pier, drydock, or on a dismantling slip, and includes a wide range of activities, from removing all gear and equipment to cutting down and recycling the ship’s structure. As ships often contain hazardous materials, such as paint with a lead content, ship breaking has become a major environmental concern in recent years. The countries that currently dominate the ship breaking market have relatively low environmental controls and there are moves by the industry to improve the ship breaking chain for the good of the environment and the people employed in the industry. Until the late twentieth century, ship breaking took place in port cities in the developed world, but today most ship breaking takes place in developing countries, particularly in Bangladesh and India.